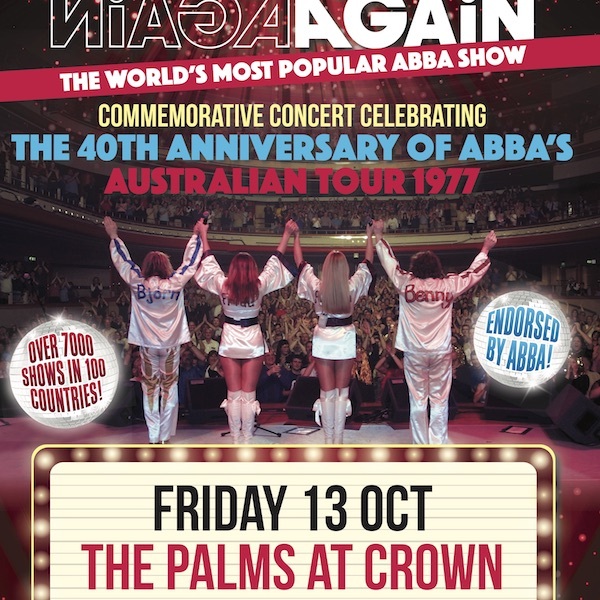 Bjorn Again performed a sellout concert at The Palms Crown Melbourne, on Friday October 13th, to celebrate the 40th Anniversary of ABBA’s Australian Tour of 1977. There was a real buzz in the foyer and in the main room before the show started as everyone was quite surprised at just how many people had attended the Melbourne ABBA concert in 1977 – 40 years ago! As well as the classic ABBA hits, Bjorn Again performed 3 ABBA songs that the act has never ever played before – ‘I’ve Been Waiting for You’, ‘I’m a Marionette and ‘Get on The Carousel’ – the latter 2 part of the mini-musical ABBA performed on tour called ‘The Girl with The Golden Hair’. Many people commented to the band at how refreshing it was to hear some rarely played ABBA songs. On the night three prizes were given out for best dressed in 1970s attire – Tram Car Restaurant, Melbourne River Cruise and The Melbourne Aquarium.